A. Tony Taweel is an experienced attorney who focuses his practice primarily on the defense of physicians, physician's assistants, hospitals, nursing homes, and other healthcare professionals involved in medical malpractice litigation. Mr. Taweel concentrates on a detailed preparation of his cases, which allows his clients to make well informed decisions at trial or during early resolution efforts. Mr. Taweel also assists health care professionals with licensing investigations and administrative licensing hearings. Mr. Taweel is licensed to practice law in Michigan and is also licensed to practice in the United States District Court for the Eastern and Western District of Michigan. He is a member of the State Bar of Michigan, Negligence Law Section, the Michigan Society of Healthcare Risk Management, the Michigan Defense Trial Counsel, the Arab American Bar Association, and is a member of the Claims and Litigation Management Alliance. 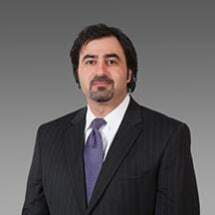 Mr. Taweel has also been selected as one of Michigan's Super Lawyers® from 2013 to the present. Mr. Taweel has lectured on a variety of healthcare topics, including: Documentation Issues and Medical Charting; A Paralegal's Guide to Medical Malpractice Cases; and Affidavits of Merit - The Truth and Only the Truth. He has further presented lectures on: Foreclosure and Repossession in Michigan; Current Developments in Fair Housing Law for Attorneys; and First Party Auto Property Damages Claims. Mr. Taweel received his J.D. from the University of Detroit - Mercy School of Law in 1995 and earned a B.S. in Economics from the University of Michigan - Dearborn in 1992.